Leonid MAC - News on Leonid shower research. 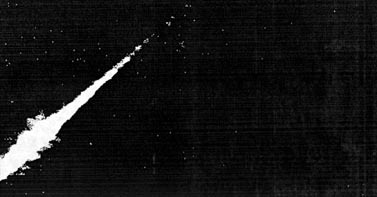 The two images on this page are snapshots (single video frames) of a bright Leonid meteor, showing twirling jet-like features. Meteoroids are often thought to melt into a nice droplet and gradually evaporate their consituent atoms. Wrong! During the 1998 Leonid campaign, A. G. LeBlanc and Ian Murray and colleagues of Mount Allison University, Canada, discovered that bright Leonids in regular white-light video images tend to have jet-like features sprout in all directions from the meteor head during flight. This result was published in a recent paper in "Montly Notices of the Royal Astronomical Society" (Vol. 313, L9). 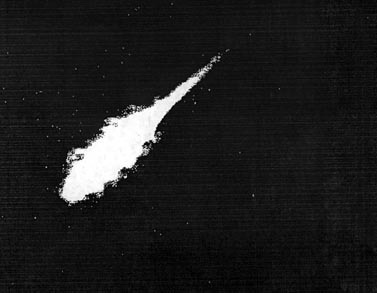 The jets form in a single video frame (< 0.033 s), which requires extreme velocities of tens of km/s, a significant fraction of the speed of the meteoroid itself. LeBlanc et al. proposed a rather exotic explanation for the cause of these "jets": electrostatic forces might cause small lighting flashes during the meteoroids descent. Wrong again! Now, Mike Taylor and co-workers have proven that the jets are caused, rather, by small bits and pieces of the parent meteoroid that are ejected at very high speed. Writing in an upcoming issue of "Earth, Moon and Planets", Taylor reports on observations with an intensified CCD camera onboard the "ARIA" aircraft in the 1999 Leonid Multi-Instrument Aircraft Campaign. Taylor tuned his camera to the light of one specific atom: Magnesium. This atom is part of the meteoroid and produces a bright green emission line at 517 nm. Images of the meteor in this particular green light show the "jets" to be turbulent structures that form very quickly. The material responsible for these wirls must contain Magnesium. Magnesium is part of the core olivine and pyroxine minearal silicate compounds. Hence the new explanation: tiny fragments of the meteoroid are being rapidly ejected away from the core meteoroid. Leonids are known to fall appart in fragments early on in their trajectory resulting in, for example, the flat-topped light curves (see Oct. 30 news). These fragments will stay together if little momentum is transfered to the grains. However, marked curvature in the jet-like structures suggests that the meteoroids are rapidly spinning. This might well contribute to the occasional fragment ejection. This result is of particular interest to Astrobiology, because the fragments are ejected quite far from the meteoroid head. Hence, the amount of air that can be chemically altered by the meteor is significantly larger than thought before (Full paper -PDF). Nov. 06 - Listen to this! Nov. 04 - Fear of heights? These and other results of Leonid storm research will appear in a special issue of the peer-reviewed journal "Earth, Moon and Planets", published by Kluwer Academic Publishers, the Netherlands.